Warm weather has returned, and it has brought some spring flowers. Most of the ones that have shown up have come up earlier than usual. Considering the consistently cold temperatures we have had until just recently, it is surprising that they are blooming already. The forsythia is showing a few flowers before its expected time, and a few of the small narcissus bulbs have opened flowers, but the one that really surprised me was the white Lady Banks rose. 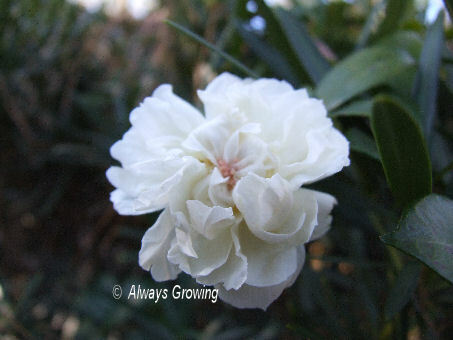 I pulled up in the driveway late Friday afternoon and couldn’t figure out what that white “thing” was on the rose canes. A quick walk over to that area, and I just couldn’t believe that a Lady Banks rose had opened up. This rose blooms in the spring, but never in January. Though it was only one small flower, it did lift my spirits because nothing beats spring flowers after cold winters. All these early flowers is just a teaser of things to come. The first of the spring narcissus (paperwhites don’t count because they start blooming in November here). Today was a great day to work in the garden. It was sunny and mild with a high temperature of 73 degrees. It was great to get out in short sleeves and work in the garden. 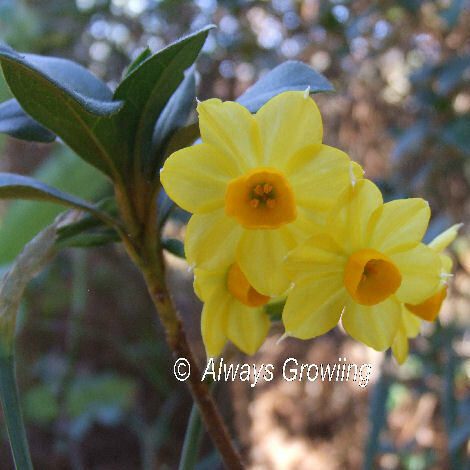 I did a lot of clean up work – cutting back winter damaged plants, cleaning leaves out of entry garden, raking up fallen camellia flowers, etc. I also moved tender plants from their protected area and placed them around the garden. Most of these, I placed in semi shady spots until they get used to being outside then I’ll move them to sunnier areas. I also used the sunny, dry day to fertilize the cool season annuals I had planted in the fall. When I planted them, I added a little slow release fertilizer, but it is used up by now. With the warm, sunny days we have been having, these annuals need a shot of fertilizer about now. Of course, I only fertilized the cool season annuals since it is too early to start fertilizing anything else. One chore I had been wanting to get to for a few weeks now was finally accomplished. 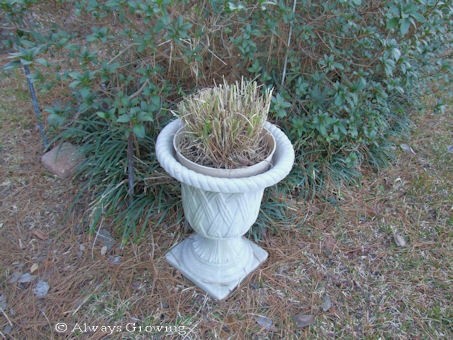 I cut back all my ornamental grasses. I wait to do this in the spring rather than the fall. I think the grass comes back from the winter better and faster when pruned in the spring. 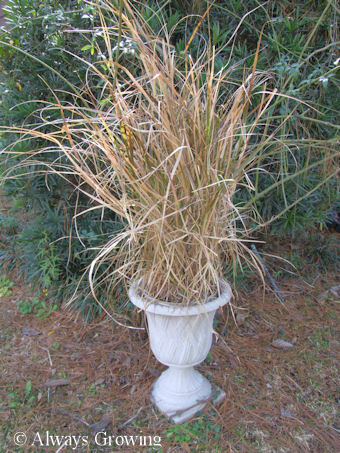 The purple fountain grass, that I grow in containers placed in urns, was looking wild and really needed cutting back. 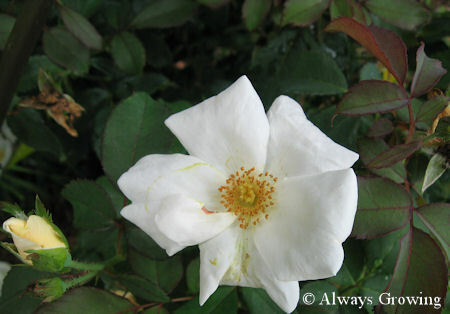 After I finished with the clean up chores I had planned to do today, I went on to planting my White Out rose. 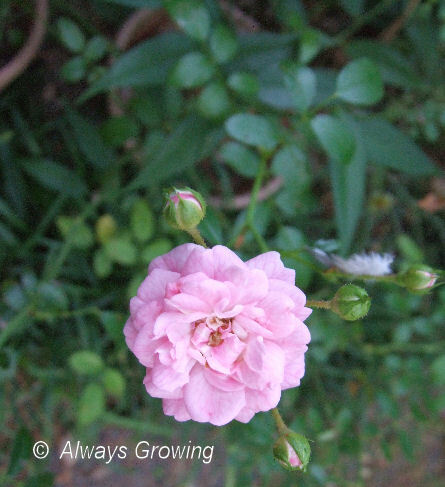 I had bought this last fall and decided to wait until spring to plant it since I wanted to place it where another rose was and that rose should be dormant to transplant. 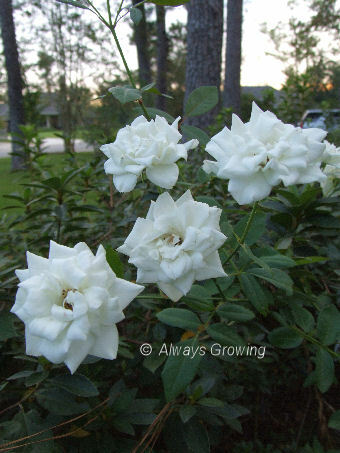 Well, today was the day, but before I could plant it, I had to dig up an Iceberg rose first. Then, of course, it is where to plant the Iceberg? 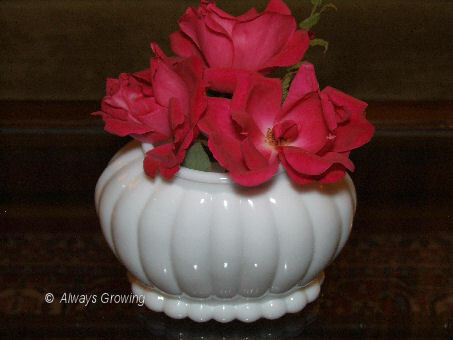 I finally decided to put the Iceberg in a large container, and then planted the White Out rose. By then, I was tired and ready to call it a day. I love days like today. Nothing can be better than sunny, bug-free, pleasant days spent outside in my garden. The last few days have been pretty nippy around here. We have had some hard freezes, but they have just been barely a hard freeze. I still have some tender perennials that have survived, but they are in more protected areas. 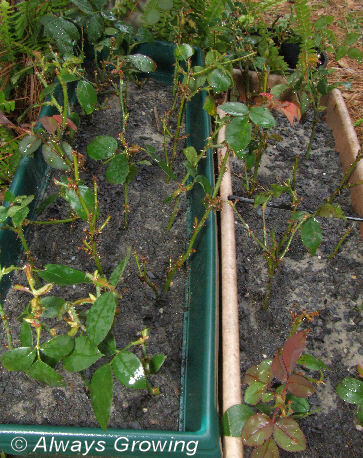 One group of plants that have not been affected by the cold weather are the roses. I thought surely that the flowers would be damaged by the cold, but so far there are still a great many lovely blooms. The Knockouts are still putting out flowers, in fact, they seem to love the cold. 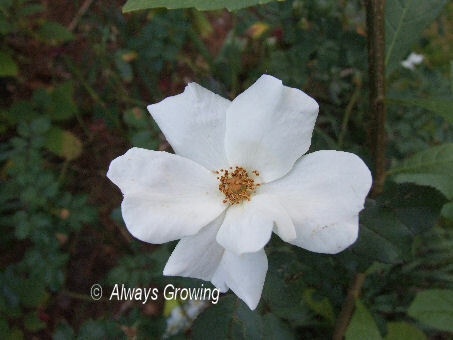 An especially appropriate named rose that is unaffected by the cold temperatures is Iceberg. 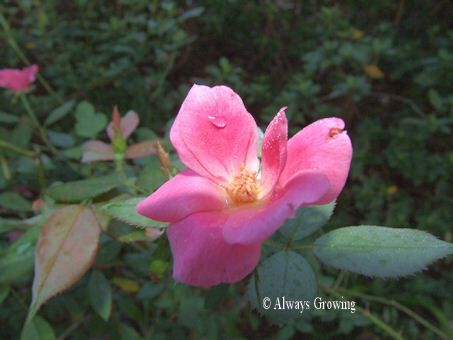 Even with lows in the high twenties, this little rosebush is putting out the flowers. I have cut a few to place with the red flowers that are decorating the the mantel for Christmas. It would be nice if they would continue to bloom so that we would have these roses for Christmas decorations. The rose and bug – sounds like some English pub, doesn’t it? 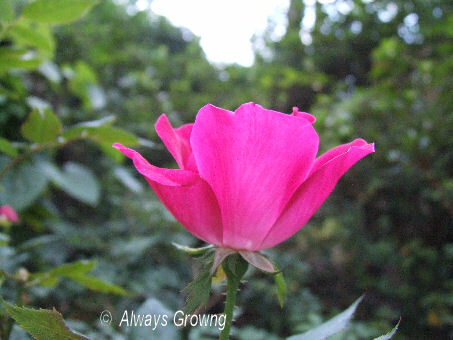 But, no, it is simply a literal statement about this photograph of the Mutabilis rose and its little visiting friend. We have been having very cool weather lately especially at night, but I have been seeing these bugs a great deal. They have been all over one of the blooming sasanqua camellia’s flowers. You would think with the cooler weather that these bugs would be gone. I guess it just has to be a bit colder to get rid of the bugs. Anyway, this rose certainly is a welcome sight. Here on the Gulf Coast, October is one of our nicest months. One of the reasons I love this time of year is that our roses start blooming again. Because of our intense summer heat, most roses bloom only sporadically, but with the first cool spell of October, the garden is again filled with roses. 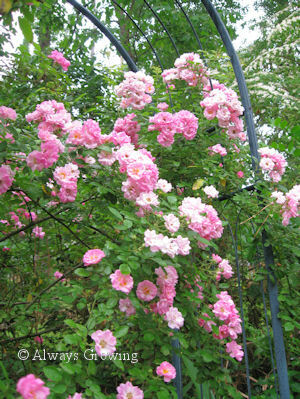 When the real cold weather shows up, roses will again slow down but not stop completely until spring. 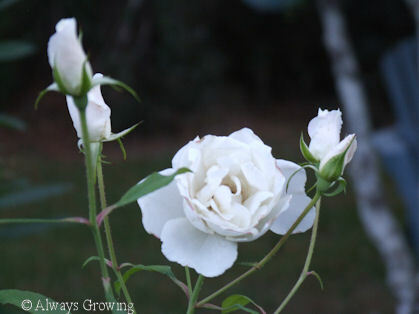 The Knockout roses are the first to start blooming again as the above pink one shows, but others, such as Iceberg, a lovely white, are also starting to flower. In the next few days, I should have several photos of all the roses that are already in bud. There are some chores that have to be done for a late year bloom period. A few weeks ago, I did a light pruning of all the roses in anticipation of autumn flowering. I also very lightly fertilized them since our first frost is around December 1st or after. Most years we don’t have our first frost until mid-December, so a light fertilizing won’t hurt. 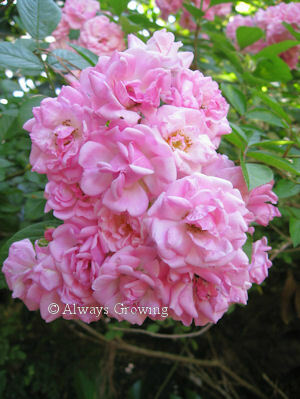 This month is also one of our driest, so that means making sure these shrubs stay watered so there will be more roses. With all the other fall flowers starting to show such as Mexican bush sage, having the roses flush out just makes everything so much nicer. This spring, I did not plant many flowering annuals, instead relying on foliage plants for color. After a summer of few flowers, it is nice to have so many fall bloomers show up. While I have been gardening for many years, it is only in the last few years that my garden has started to look like I envisioned it eventually would. It seems as if the garden is finally starting to mature. Plants that were small for so many years have, it seems, suddenly grown big enough to make a nice showing. Because I have a very shady garden with clay soil, it has taken longer for plants to reach a good size as it has taken a while to improve the soil. Of course, the shade didn’t help, either. 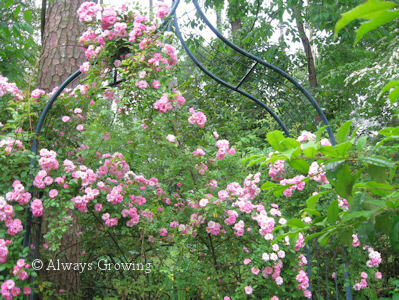 One plant that is showing it has matured is a climbing rose bush my mother gave me. 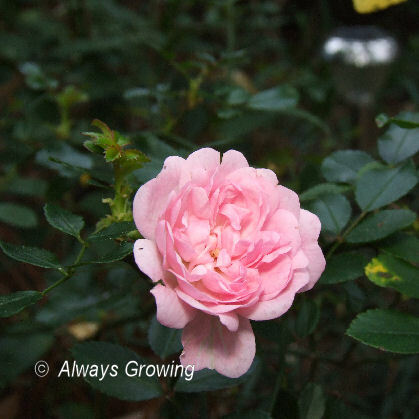 For years, this rose has grown slowly and put out a sparse flush of blooms. This year, however, it is finally looking good. If it was in more sun, this would have happened a lot sooner, but I am glad there is a good show this year. I am not sure of the name of this rose as my mother started with a cutting from a friend. I do know that it was very popular in the ’60’s, and it is often seen in the older neighborhoods around here. One of the nice aspects of this rose is the cluster of blooms it makes. 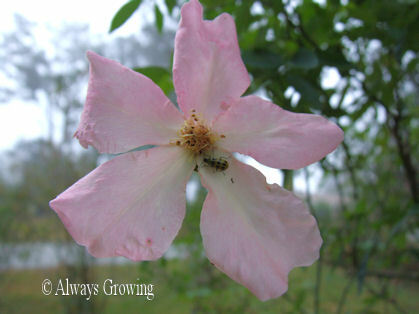 Since the flowers open at different times, there is often many shades of pink in the cluster. This may be why some people call this rose Seven Sisters, but I am not convinced this is the correct name for this particular climber. I am just happy this rose has finally gotten some growth on it. I have noticed, especially this spring, that many of the plants in my garden seem to have grown into their mature size. Finally, the garden is starting to look like I always hoped it would.